Oh, my cosmic cohort, there are so many secrets. So many insider goings-on that we, the average work-a-day peons, know nothing of. Woops, ended a sentence with a preposition there. I meant to say “so many shenanigans of the rich and powerful that we pee-a-day workons of which know so little.” Or something. You know, we hear things now and again. We get these vague hints of the clandestine workings of the movers and shakers. 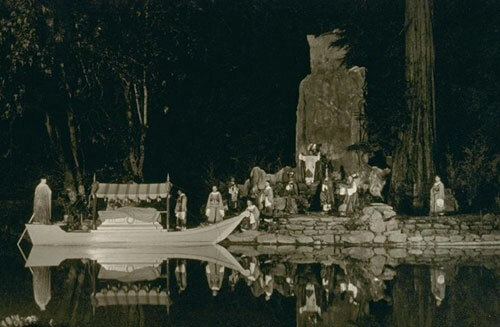 Like the Bohemian Grove. Have you heard of the Grove? This is a private patch of forest in California where, every summer for a fortnight or so, presidents and industrial magnets and oil typhoons and such all gather to rub elbows and smoke cigars and urinate outdoors. Women aren’t allowed, presumably because they would ruin the whole pee-party milieu. Look it up if you think I’m joshing. There are other such truths kept in the shadows. Hopefully, most of them don’t involve urinating outdoors. Ya know, stuff like Area 51; secret underground bases where alien races are kept as gold-mining slaves; the president’s ultra-secret attaché case; black helicopters; Skull and Bones; the Freemasons (not to be confused with the Freemansons, a cult that worships deceased Beach Boys drummer Dennis Wilson); etc. BUT…there’s one tightly kept secret I recently uncovered that will curl your ear hair. I don’t think even Alex Jones has gotten wind of this one. Yes. The Candy Desk. 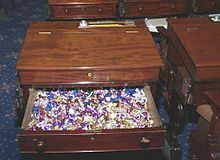 Unbeknownst to the common rabble, since 1968 U.S. lawmakers have kept a hidden stash of gum and jawbreakers and little butterscotch treats in a secret desk somewhere on the floor of the congressional chamber. The whole thing apparently started with a California senator named George Murphy, and for some reason, The Candy Desk has largely been in Republican hands ever since. That makes sense somehow. Ostensibly, the desk of delectability is accessible to both parties, but given today’s polarized political environment, I would imagine the Democrats are relegated to the second-tier sweets—you know, the licorice and candy corns and all those off-brand pieces of drek you find in your Halloween bag. Meanwhile, I’ll bet the Repubs get the Dove bars and Milky Ways and all. It’s outrageous, really. I can accept the political infighting creating such gridlock that the nation’s economy ends up in total ruin, destroying millions of American lives—but I’ll be damned if I’m going to sit by while the political heirs of greats such as Ted Kennedy, Tip O’Neill, and LBJ have to chew on Smartees and Necco Wafers while the fat-cat Republicans hog all the Hersheys. Anyway, this was not my major point. While tracking down the history of The Candy Desk, I found some other secret stashes—these hidden in the chambers and catacombs of many of our very own state legislatures. Take, for instance, the Colorado General Assembly in Denver. Did you know that in the Colorado House of Representatives chamber, there is—known to only lawmakers and a few insiders—The Doobage Desk. Yes. This is why, although there is still a political divide in the Rocky Mountain State, it consists mainly of debate over things such as naming the State Munchie. At present, the Dems favor Xtra Flamin’ Hot Cheetos, while the Repubs lean toward Caramel Kettle Korn. There are others. In the State Capitol in Austin, you have The Ammo Armoire, for those forgetful lawmakers who may have left their sidearm bullets at home. The Florida Legislature in Tallahassee has a well-hidden desk known as The Hanging Chad Hamper, where legislators can view with pride their state’s claim to national fame. The Mississippi State Capitol in Jackson houses The Dictionary Drawer, to be used to look up those pesky big words and spellings of high-falutin’ terms. In Sacramento, capital of the debt-ridden California State Legislature, they have The Coupon Cubby. This is a secret pile of two-for-one lunch deals at Arby’s and such for lawmakers working for a state on the brink of total collapse. Now, here’s an interesting one. In the lower Alaska House of Representatives chamber in Juneau, they have a well-guarded little cabinet known as The Binocular Bureau. Alaskan lawmakers dip into this now and again so they can view Russia, following the lead of that great Alaskan, Sarah Palin. I’m thinking of starting a secret drawer of my own here at work. Known only to me and those like me, it will be accessible only through a cryptic passcode, kept by me. I’ll call it, say, The Smirnoff Shelf. Oh, wait. I already have that. Well then, skoal! ← ‘Stepped on a Pop Top, Cut my…’ Stepped on a What?